Observation balloons were commonly adopted by all sides and considered ideal in the static trench warfare conditions largely peculiar to the First World War. Gas or hot-air propelled, such balloons were by no means a new innovation in terms of military adoption, having been put to use as early as the 18th and 19th centuries. However they were deployed extensively along the Western Front in particular. Winched into the air, seldom alone, they were usually accompanied by one or two others for comparative observation purposes. Observation readings were passed down via the use of flags or occasionally by radio, and balloon operators would generally remain in the air for hours at a spell. It was regarded as a dangerous job, for although observation balloons were invariably heavily protected by anti-aircraft and machine gun fire and by wire meshes dangled between groups of balloons, they were often the irresistible stationary target of enemy aircraft. So far as the various air forces were concerned, bringing down an observation balloon was regarded as a valid victory and were added to each pilot's list of 'kills' in the same manner as enemy aircraft. This was because downing balloons was considered something of a hazardous occupation, although some pilots established reputations as 'balloon busters' (such as the Belgian Willy Coppens, who brought down 35 balloons, the highest single total of the war). Bringing down balloons was deceptively problematic. Standard bullets were usually insufficient in themselves, passing directly through the balloon's fabric without setting it alight. When under attack operators on the ground would hastily winch down the balloon and unless the attacking aircraft could succeed in setting the balloon alight - by the use of incendiary or explosive bullets - he would have failed in his mission. Many pilots were careful not to pursue balloons beneath 1,000 feet for fear of the devastating consequences of anti-aircraft fire. British servicemen were permitted to don parachutes to escape should the balloon come under successful enemy fire, although the chances of a safe escape once the balloon was ablaze was slim. 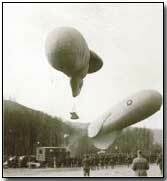 Balloons were additionally used for home defence purposes and were flown in groups via cables in major cities such as London, each balloon dangling steel cables to form a kind of apron into which attacking enemy aircraft could find themselves entangled and so be brought down. To evade such defences attacking aircraft were obliged to fly at ever higher altitudes, reducing the likelihood of a successful, accurate bombing raid.